On the eve of the Marcellus Shale boom, we at the West Virginia Center on Budget Policy released a report on the economic boom and bust cycles of West Virginia’s natural resource extraction economy. AS the report showed, counties in West Virginia with high concentrations of mining employment were particularly affected by the boom and bust cycle, as production grows and shrinks, energy prices rise and fall, and the resources themselves are depleted over time. And while, communities can rely on energy development for economic growth in the short-term, the boom is unsustainable. If trends hold, the boom ultimately leads to a bust, followed by decades of underperformance. The report, which was published in 2011, ended with a note that the pattern is likely to repeat itself in counties that focus heavily on the Marcellus Shale development. Since then natural gas production has exploded in West Virginia, increasing from 297.9 million mcf in 2010 to 1.4 billion mcf in 2016. 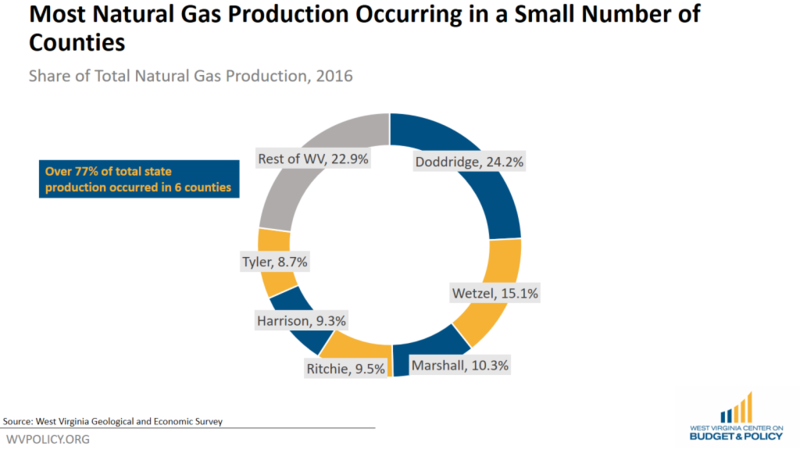 The boom in natural gas production has been concentrated in a handful of counties in West Virginia. In 2016, 6 counties (Doddridge, Wetzel, Marshall, Ritchie, Harrison, and Tyler) accounted for over 77 percent of the natural gas produced in the state, with each producing over 120 million mcf of natural gas that year. 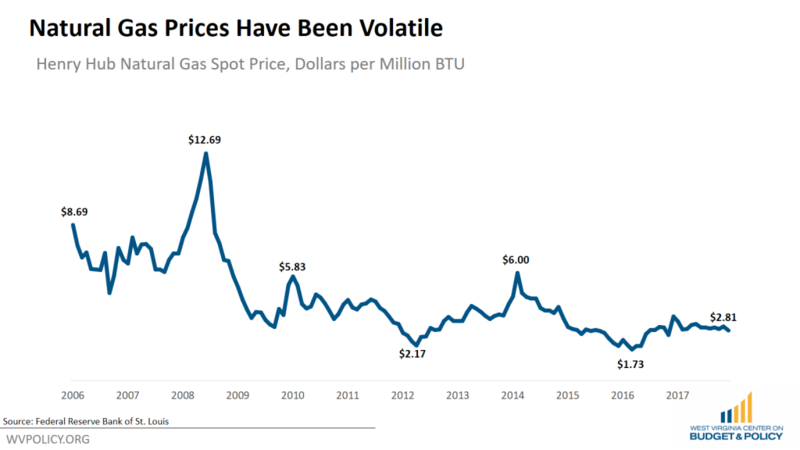 The price of natural gas during this time period has been volatile. 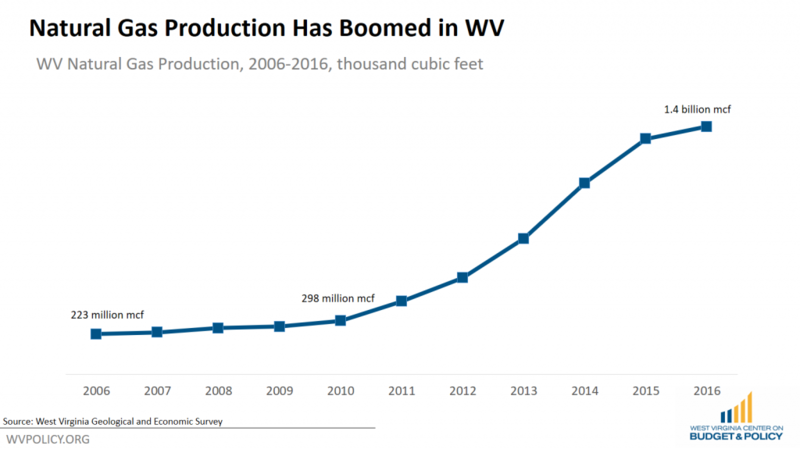 Prices fell sharply when production first began booming, falling from $5.83/million btu in 2010 to $2.17 in 2012 as production in West Virginia first began to take off. Prices recovered between 2012 and 2014, fueling the biggest acceleration in West Virginia’s production, but as prices fell again in 2014, the pace of production in West Virginia began to slow. 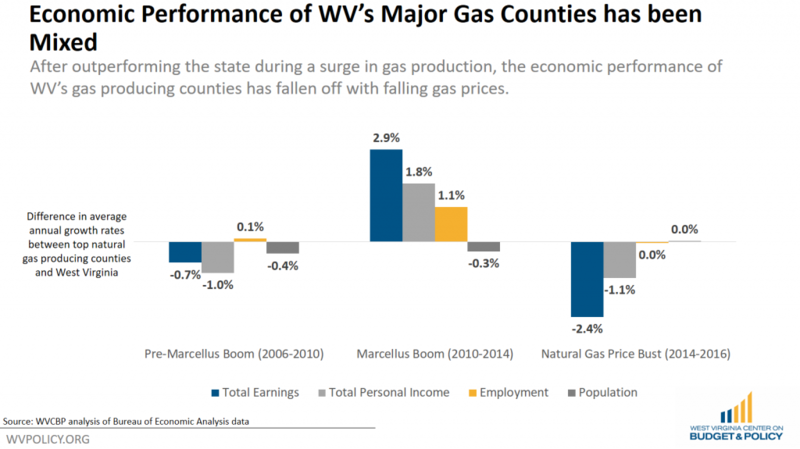 Using the same economic indicators as the “Booms and Busts” report (total earnings, total personal income, employment, and population) a clear boom and bust pattern can be found in West Virginia’s top gas producing counties. And while the original report on the state’s mining counties found a boom and bust pattern stretching over decades, the pattern is accelerated for the gas counties and is strongly influenced by the volatile price of natural gas. The figure below shows the difference in the average annual growth rates of West Virginia and the top gas producing counties for each economic indicator. Bars above the line mean that the gas counties had higher growth rates than the state on that measure. Bars below the line mean that the gas counties had lower growth rates than the state. In the years leading up to the natural gas boom, West Virginia’s natural gas producing counties experienced relatively slower growth than the state as a whole, trailing in earnings, income, and population growth, while experiencing slightly higher employment growth. During the initial boom in natural gas production, starting in 2010, the gas counties saw much faster rates of growth in earnings, income, and employment, but still saw less growth in population (in fact losing population). But when natural gas prices began to fall in 2014, the economic boom busted, and the counties began to experience slower earnings and income growth, with no better employment and population growth than the state average. The accelerated boom and bust cycle means that for several of the state’s top natural gas producing counties, many of their economic gains have been wiped out by falling natural gas prices, even as they continue to produce natural gas. For example, Wetzel county produced over $1.7 billion in natural gas from 2010 to 2016, including $353 million in 2016. But the county has experienced no net job increase since 2011, and has lost 338 jobs (-5.3%) since its peak in 2012. The same can be said for Marshall county, which since 2010 has produced over $1.1 billion in natural gas, including $271 million in 2016. In 2016 Marshall county had fewer jobs (13,006) than it did in 2009 (13,736) and has lost over 1,500 jobs (-10.4%) since its peak in 2013. 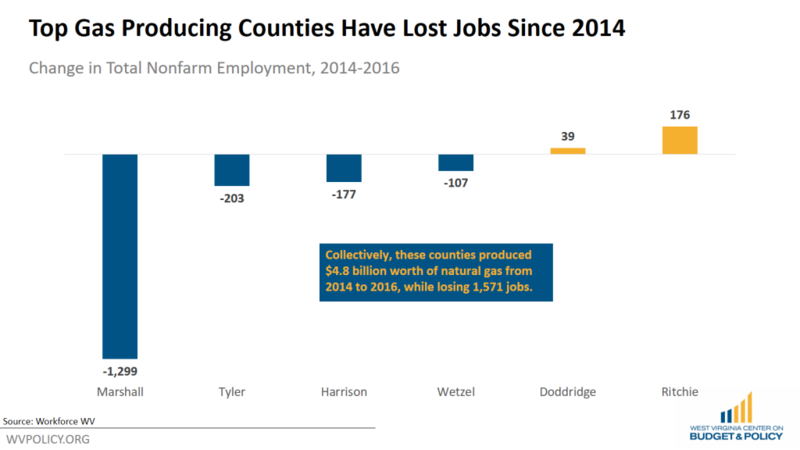 Overall, since the crash of natural gas prices starting in 2014, West Virginia’s top natural gas producing counties have lost 1,571 jobs despite producing $4.8 billion worth of natural gas. In the past, West Virginia saw its mining counties surge ahead and then under-perform during a decades long boom/bust cycle that left those counties economically weaker and ill-positioned for sustainable growth. That pattern has shown itself again in the state’s natural gas counties, only the economic boom happened over a much shorter span of time, with the bust coming much quicker, with the fortunes of the natural gas counties tied to the volatile price of natural gas. Several years into the state’s natural gas production boom, these counties have produced billions of dollars worth of natural gas, with little to show for it.